SPRING IS JUST A FEW, SHORT WEEKS AWAY BUT THE COLD WEATHER HASN’T STOPPED OUR EDIBLE GARDEN PARTICIPANTS FROM KEEPING BUSY, DEVELOPING SKILLS AND GROWING SOME BEAUTIFUL PRODUCE. 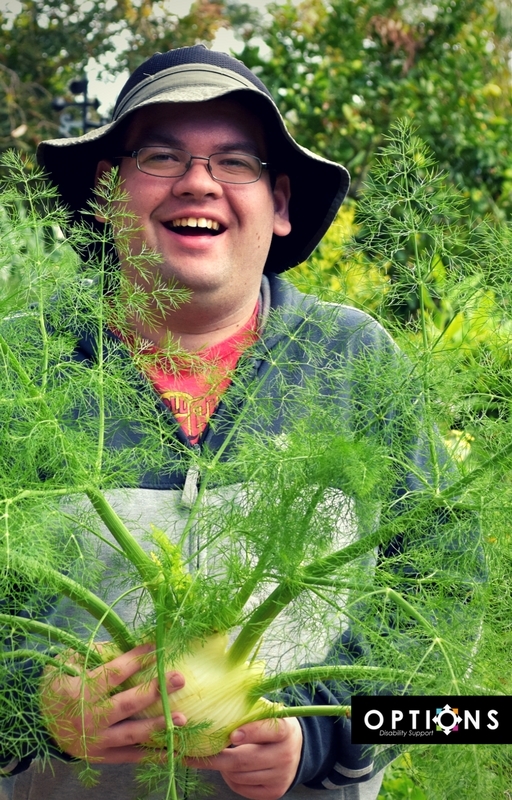 The Edible Garden is Options Disability Support’s social, horticultural and sustainability program run by chief Horticulturist and Disability support worker Reece Tunbridge. It’s more than a garden though, it’s a café, print room and place for people to gather over lunch and a cup of coffee. It’s a place for animals, plants, hard work and fun, encapsulated beautifully in its motto: ‘where people and plants grow’. Reece has seen a lot of growth in the past five years and loves the philosophy of the program, “it really is a social place and the guys have loads of fun learning new skills in a beautiful garden that is completely sustainable”. And there’s never a shortage of things to do, with 2 goats, 10 chickens, 5 ducks, 2 guinea pigs, a rabbit and a lizard named ‘Steve’ to care for. Plus there’s always plenty of weeding, propagation, mulching, pruning, digging and composting to keep the garden humming along. The various garden tasks are tailored to the individual’s abilities, with a huge focus on independence and achieving goals. And winter has seen a bumper crop of edibles perfect for use in the café, “winter is a great time in the garden, it’s not too hot to work, the ground is soft and this season we’ve grown lettuce, Asian greens, broccoli, cauliflower, cabbage, spinach and kale” Reece says. Participants will soon have individual plots do grow whatever they want, as the Garden continues to evolve, but one of the highlights will always be picking the produce to give to the café to use for its lunch menu. This week’s crop made a delicious Asian Stir Fry which you can try for yourself below. Please phone (02) 4340 5155 or email admin@optionsdisabilitysupport.org.au for more information about the Edible Gardens and other supports or about our role in helping you transition to the NDIS. And don’t forget to follow us on facebook! Boil some water in a sauce pan on the stove. Once water is boiling add in rice. It should be cooked through in about 10 mins. Zest the ginger and garlic, Juliane (finely slice) the carrot and capsicum. Cut broccoli into small florets. Cut the Top and bottom of the snow and sugar peas, then slice into bite size pieces. Finely shred the Asian green. Heat oil in pan and add ginger and garlic then add, spring onion, broccoli, capsicum, carrot cook for a couple of minutes then add the sugar and snow peas and Chinese five spice. Add Asian greens and stir fry for a few more minutes until greens start wilt before serving add in the oyster sauce and stir. Vegetables should be firm and not soft.